Hardwood flooring has been around for hundreds of years, and the tradition is still going strong to this day. With its unmatched strength and natural beauty, hardwood has proven itself immune to fleeting trends. Hardwood flooring is available in a wide variety of colors, finishes, species, and dimensions, with great selections for both commercial and residential locations. While a hardwood floor often requires a significant upfront investment, it will likely outlast other types of flooring if properly situated and maintained. Are you considering a hardwood floor for your home, or for your office? Here is some information to help you navigate the process, before you start shopping. Solid hardwood is the original form of hardwood flooring. Solid hardwood is made out of solid wood planks and can be refinished over and over again. It is authentic and extremely enduring, so it appeals to traditionalists. Solid hardwood cannot be installed below grade, however. Engineered hardwood is a modern answer to hardwood flooring’s prior challenges. Made in a factory, engineered hardwood is built in layers and has a protective top coat to serve as a barrier between floor and furniture. It can withstand a fair amount of moisture and can even go below grade. Your engineered hardwood floor can only be refinished once or twice over its lifespan. The wood species used to construct your floor will greatly affect select its final appearance. Whether finished close to its natural state, or something more dramatic, your new floor’s function and visuals are closely attributed to its chosen species. There are species offering traditional looks, such as pine and oak, as well as those taking your imagination to far-flung destinations, including mahogany and teak. The choice is yours. At World of Carpet One Floor & Home we’re proud to offer all the latest and greatest in solid and engineered hardwood flooring products. Our seasoned industry experts are always excited to share their knowledge and help guide you towards hardwood that fits all your needs and desires. 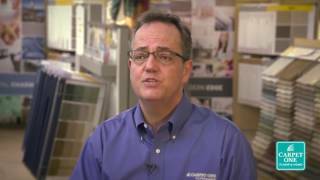 You can take comfort in knowing that, as part of the nation’s largest cooperative of independent flooring stores, we can offer you the buying power of hundreds of other stores: further extending your possibilities. Your home’s main comfort zone, your living room is the place where you relax after a long day at the office. Having a floor that is beautiful to look at is important, but so is your comfort. While extremely durable, humidity can sometimes be a concern for hardwood flooring. Here’s what you need to know about humidity, moisture, and your hardwood floor. Installing a new floor can be a stressful time, but with our Healthier Living Flooring Installation System, you can take a couple worries off your list and enjoy a cleaner, healthier home.